Dewees Island is an environmentalist's home sweet home and a paradise for any beach lover! Its proximity to Charleston (12 miles) makes it very conveniently close to the attractions and bustle of the city, but its environmentally friendly developments make you feel as though you are as far away from the stress and noise of a big city as one can be. Beautifully situated 2.6 miles of beachfront, dune, marsh, and maritime ecosystems make one feel as though they are stepping back in time to a coastal paradise. Traffic is never a problem, because the island has no gas powered cars! Dewees Island is accessible only by boat. 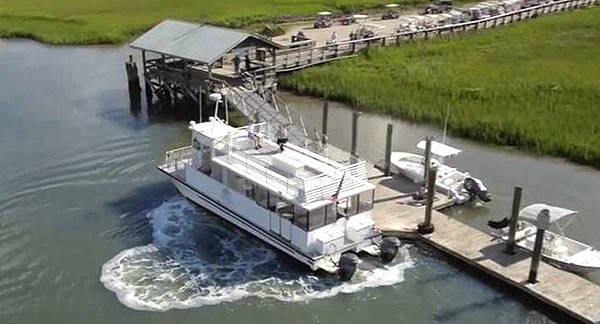 The Aggie Gray ferry runs hourly and on demand from Isle of Palms. Residents use electric golf carts on roads of beautiful crushed limestone to get around this beautifully pristine island, and many maintain their own docks and boats. The island’s developers designed an advanced recycling and composting system, with a reverse osmosis system to meet the entire island's residential water needs. Dewees is rich in native American history, Revolutionary War history, Civil War blockade runner history, and has a World War II submarine watch tower. Likely one of the original hunting islands used by the Sewee Indians, Dewees Island (then known as Timacu Island) was owned by the British until Thomas Cary aquired it in 1700. Cornelius Dewees gave the island its new name in 1701. Largely used over the years for farming indigo, rice, artichokes, cane, swine, and cotton and for harvesting oysters and clams, the island didn’t see much modern development until the 1970s when construction began on a few vacation homes. In 1991, the Island Preservation Partnership was formed to develop the island. When building is eventually finished with only 150 homesites, 95% of the island will still be in its native state thanks to stringent construction and design guidelines that will minimize impact on the wildlife and ecosystem. An advanced recycling and composting system as well as a reverse osmosis system to allow residents to meet their needs for fresh water will ensure that the environment on Dewees Island remains protected and pristine. A beautiful array of birds, deer, diamondback terrapin, and even mink call this beautiful island home and live in harmony with its residents. To minimize environmental stress, the maximum home size is limited to 5,000 square feet. Additionally, builders are not to disturb more than 7,500 square feet of a lot during home construction. No worries about hiring a lawn service or cutting the grass! Lawns are not permitted. Homes are beautifully surrounded by, protected from the elements, and landscaped with native vegetation. As with most coastal island communities, the houses are elevated and no matter where you choose to build, your home will have a water view of either tidal creeks, lakes, the Intracoastal Waterway or the majesty of the Atlantic Ocean. Dewees Island Real estate ranges from fractional ownership with prices in the low $200,000s, homes around a million, to oceanfront lots at $2 million. If living in harmony with nature in an unspoiled area is your heart's desire, Dewees Island may make your dream come true. See the Charleston office website at www.c21CharlestonRealEstate.com (or click the link above!) for more information.